As the closest Days Inn to Kennedy Space Center, the Days Inn Kennedy Space Center Titusville offers the best of both worlds, spacious guestrooms with two QUEEN beds at an affordable price and strong dedication to customer satisfaction. Convenient location at the intersection of Highway 95 and Highway 50 at Exit 215, our hotel is a logical choice for the corporate traveler and vacationers alike. For your added convenience the Days Inn Kennedy Space Center offer a complimentary deluxe hot Daybreak breakfast we also have an IHOP Restaurant located inside the hotel, serving Breakfast, Lunch and Dinner and open 24 Hours. AAA Approved and members receive 10 percent off stay at time of booking. Shuttle service available from independent company, charges apply based on destination. All of our rooms are fully renovated and designed with your comfort in mind - All furnished with Coffee Makers, Hairdryer, AM/FM Clock Radio, HBO and expanded Cable service. Iron and Ironing Board is now available in ALL guest rooms. Sofa Bed and Work Desk in select rooms. 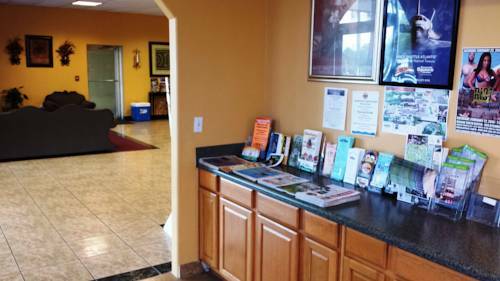 Guest Laundry facilities and Business Center are also available onsite. If you are in the mood to relax and unwind, our outdoor pool and sun deck has also been renovated and offers a peaceful retreat away from it all. Now offering FREE wireless high speed internet access throughout the hotel. Bus/Truck Parking. If you are coming into town to see a Shuttle Launch, we are located just 11 miles from Kennedy Space Center and Astronaut Hall of Fame, and only 20 Miles from Port Canaveral Cruise Lines. Whether it is an overnight trip or a getaway vacation, let our caring staff make the Days Inn Kennedy Space Center your Home Away from Home. NOTE - Meeting space available - We will gladly work with Groups, please just call us for additional group related information. Cocoa Expo Sports Center - 11 Miles from hotel. Pets Allowed- Small pets only- for a fee. Pet rooms located on second floor only.